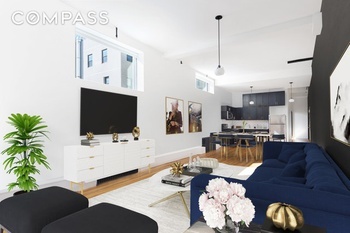 Situated in an old steel factory and just 4 blocks from the Bedford L train, these converted apartments are the epitome of updated loft living. Situated in an old steel factory and just 4 blocks from the Bedford L train, these converted apartments are the epitome of updated loft living. With original & carefully preserved details like exposed brick, duct work and wood beams, Lewis Steel offers residents the opportunity to live in a piece of Williamsburg's history. Further enhanced by the modern, top-of-the-line kitchens, generously sized living spaces, a fully landscaped roof deck with BBQ and exciting details like gas-fireplaces, skylights and private outdoor space in many units, Lewis Steel compares to none. Stunning 3 bedroom loft on 4th floor, features a very spacious living space and a gorgeous 'L' kitchen with stainless steel appliances. Large windows through out flood the apartment with natural light, it is truly a perfect home. 10% Discounted membership options for tenants at nearby gym on Berry St- Brooklyn Athletic Club. We invite you to schedule an appointment to avoid potential wait times. Please call 646.896.3764 today. Images are for illustrative purposes only, and may be from a similar or model unit within the building. *Net Rent Advertised with 1 Month Free on Select Lease Terms. LOFT 424 is a 3 Bed, 1 Bath that features the largest loft living room in the building at 41' long and boasts 14' vaulted ceilings, and massive casement windows. Each authentic loft is meticulously renovated with stainless steel appliances, including a dishwasher and in-unit Bosch washer/dryer this east and south facing apartment. Situated just 3 blocks from the Bedford L-Train and half a block from the Whole Foods, the Apple Store and Equinox; the Lewis Steel building is located in prime Williamsburg. At the base of the building is Blue Bottle Coffee, Chrome Industries, McNally Bookstore and more new retailers! The Lewis Steel Building affords a variety of public and private outdoor spaces including a resident co-working space and library, a massive furnished and communal roof deck with a bocce/corn-hole court, private cabanas, a sun deck with lounge chairs and a roof top shower, and sweeping views of Manhattan and Brooklyn. There is a doorman daily from 7am – 11pm daily, private bike storage, parking available and ZipCar access. The building is wired for Verizon Fios and is pet friendly. The building also features a private art gallery and collection curated by famed artist, Josana Blue. ***Gross price is $6,000 – net effective price advertised is based on 1.5 months free on a 18 month lease.